I absolutely love a blush palette, I must admit. 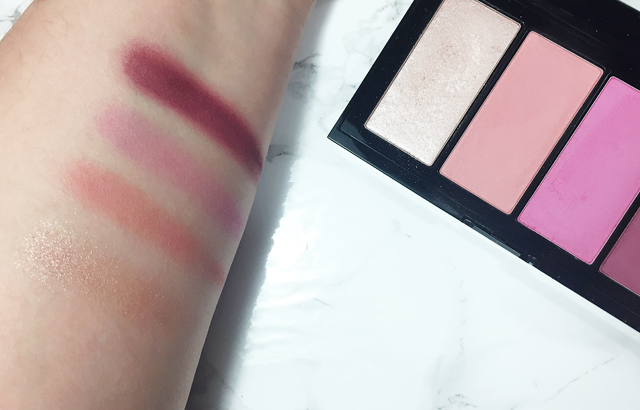 For someone like me - aka, not a makeup artist - they may seem to be a little bit overkill but I love being able to reach into my blush drawer, grab a palette with a good variety of shades and a good formula, and choose exactly what I need without fuss. Also, I think every makeup junkie needs a blush palette for travel. 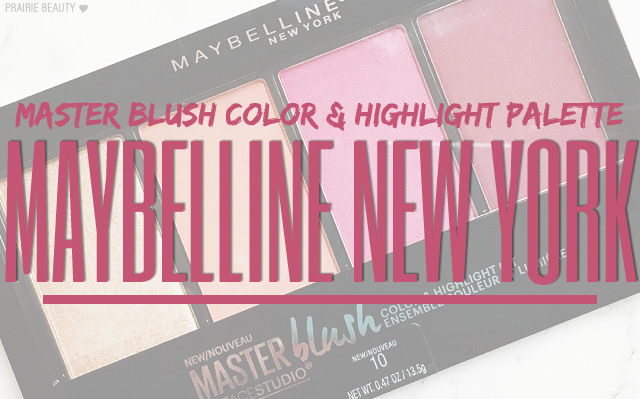 Anyway, this is why I've been eyeing up the Maybelline Masterblush Colour & Highlight Palette* ever since it was released. I've actually had it in my head several times, but hadn't gotten around to picking it up and recently it was sent to me to try out from Chickadvisor. I've been giving this a serious test, so keep reading for my thoughts! I have to say, I really like what Maybelline is doing with their packaging lately. I feel like the sleek black gives it a really modern look and I really like the font choices. With this palette specifically, I really like the size of the pans, which can be a bit of an issue with a lot of blush palettes that include really small pans. This one has what I would consider basically full size blushes in the palette, which makes it a great value. I think the shade selection could be the thing that might make some people uncertain about this palette, because I don't necessarily think everyone will be 100% on board with every shade. That said, I actually really love this shade selection because all three shades are vastly different, making this a really versatile palette. Personally, the peach shade is definitely the one that I've been reaching for the most and will likely keep reaching for throughout the hotter months, but the pink would have been perfect for more cool toned spring looks and the deep berry shade - when used with a light hand on my skin tone - will be amazing for winter. Now let's talk about each shade, starting with the highlighter. I know that this powder likely won't be for people who are really used to blinding, super metallic highlights, but I actually think this is really pretty for every day. The shade, to me, feels like a champagne with a rosy peach base, which I think tends to give a more natural look to the skin but doesn't have the really strong lifting effect of something leaning more icy for fair skin and golden for deeper skin. I think the powder is fairly smooth and although it can be a little bit chunky when you swatch it on your finger, I find it blends out really well on the cheeks as well. Overall, I think this is a nice highlight for my taste but that it will be very much about preference whether you like this or not. Next is the blush I've been reaching for most consistently for the past few weeks, and that's the peach shade. Honestly, this shade is perfection, in my opinion and if they ever release it as a single I'll buy that too. The peach tone is just right, without too much pink or too much orange in it, and is really flattering on the skin. Because it's so pigmented, I actually think this will look beautiful on a lot of different skin tones. The formula is also pretty dreamy, with a really creamy, blendable texture that applies really easily and without too much worry of going overboard. I'm honestly in love with this blush! Third in the palette we have a very blue toned pink shade that I think will be polarizing. For me, I think this shade is great in that it's very fresh looking. I think blue toned blush tends to help give a youthful look to the skin, though it can be harder to wear than something more neutral. For me, the formula of this one is the least impressive. 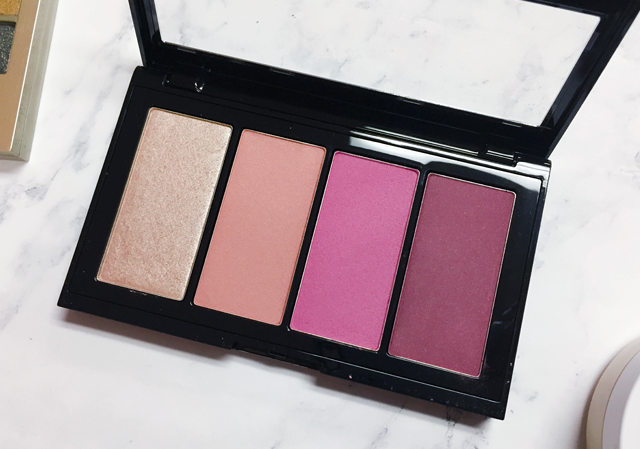 The texture is a little bit drier than the other two blushes in the palette, giving it a slightly powdery texture that isn't as smooth. Still, blended out on the cheeks I think it looks really good, not powdery at all, and the pigmentation is really strong so I'd advise a light hand to start. Finally, we have a deep berry toned shade that I think will be intimidating to a lot of people with lighter skin tones. For me, this is the type of shade I like to reach for in the winter when I'm embracing my paleness and skipping the bronzer, because when applied lightly it gives that fresh in from the cold look to the cheeks. This formula of this shade is pretty much identical to the peach shade, with a creamy, smooth texture and a ton of pigmentation. With this shade, I'd really recommend using a very light hand and even tapping your brush off on the back of your hand to remove some of the pigment (if you're fair like me anyway) and I'd also recommend using a slightly denser blush brush to really buff it into the skin and get a good blend. Still, gorgeous shade, great formula, and very workable. 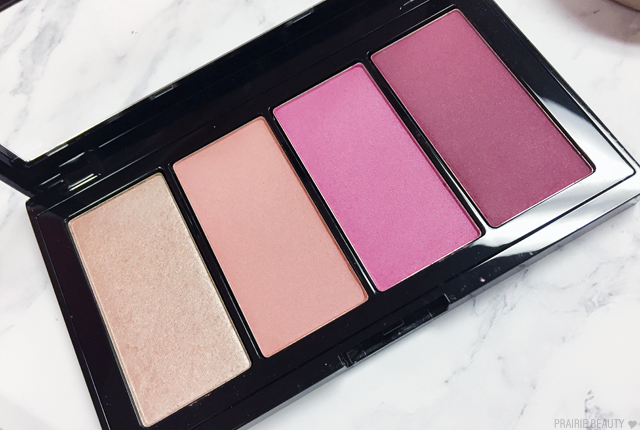 Overall, I'm really happy with this blush palette and I think it's a great value. You get a ton of product in this palette and a lot of variety for pretty much any kind of look all in one place. I think the highlight might end up being a deal breaker for some people, but I personally quite enjoy it for an every day natural glow to the cheeks. And honestly? I think I would have actually bought this for the peach shade alone because it's just that pretty! 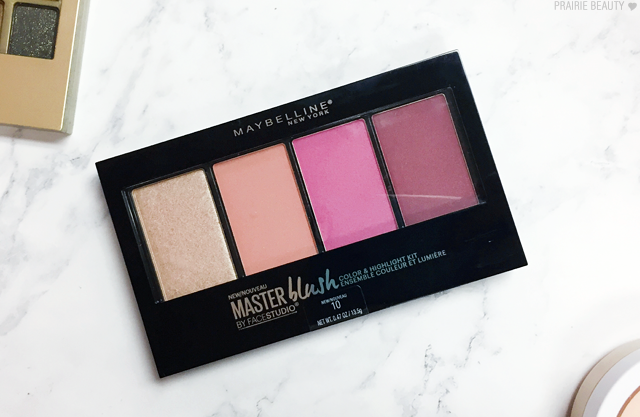 The Maybelline Master Blush Color & Highlight Palette is available now wherever Maybelline is sold and I've been consistently seeing some great sale prices on it, so I'd definitely recommend checking it out if it seems like it would be in your lane!